Italian children have been told not to turn up to school unless they can prove they have been properly vaccinated. The deadline follows months of national debate over compulsory vaccination. 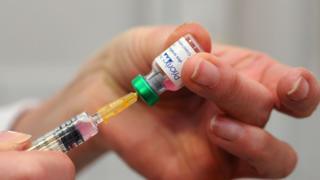 Parents risk being fined up to €500 (£425; $560) if they send their unvaccinated children to school. Children under six can be turned away. The new law came amid a surge in measles cases - but Italian officials say vaccination rates have improved since it was introduced. Under Italy's so-called Lorenzin law - named after the former health minister who introduced it - children must receive a range of mandatory immunisations before attending school. They include vaccinations for chickenpox, polio, measles, mumps, and rubella. Children up to the age of six years will be excluded from nursery and kindergarten without proof of vaccination under the new rules. Those aged between six and 16 cannot be banned from attending school, but their parents face fines if they do not complete the mandatory course of immunisations. The deadline for certification was due to be 10 March after a previous delay - but as it fell on a weekend, it was extended to Monday. "Now everyone has had time to catch up," Health Minister Giulia Grillo told La Repubblica newspaper. She had reportedly resisted political pressure from deputy prime minister Matteo Salvini to extend the deadline even further. Ms Grillo said the rules were now simple: "No vaccine, no school". Italian media report that regional authorities are handling the situation in a number of different ways. In Bologna, the local authority has sent letters of suspension to the parents of some 300 children, and a total of 5,000 children do not have their vaccine documentation up to date. In other areas there have been no reported cases, while still others have been given a grace period of a few days beyond the deadline. Is the law having an effect? The new law was passed to raise Italy's plummeting vaccination rates from below 80% to the World Health Organisation's 95% target. On Monday - the last day for parents to provide documentation proving their children had been properly vaccinated - the Italian health authority released figures claiming a national immunisation rate at or very close to 95% for children born in 2015, depending on which vaccine was being discussed. The 95% threshold is the point at which "herd immunity" kicks in - when enough of the population is vaccinated for the spread of the disease to become unlikely, thereby protecting those who cannot be vaccinated. That includes babies too young to be vaccinated themselves, or those with medical conditions such as a compromised immune system. Last month, an eight-year-old recovering from cancer was unable to attend school in Rome due to his weak immune system. The child had spent months receiving treatment for leukaemia, but was at risk of infection because a proportion of pupils in the school had not been vaccinated - including several in the same class. The Lorenzin law, drafted by the previous government, had a tumultuous birth. When the current coalition came to power, it said it would drop mandatory immunisations although it later reversed its position. The two populist parties in power had faced accusations that they were pursuing anti-vaccination policies. Writing in a Facebook post on Monday, Ms Grillo admitted it "is a law that, at the time of approval, we criticised for several reasons" - and said that the law would be changed to include only those vaccinations that were necessary based on scientific data. Why do parents not immunise their children? The anti-vaccination movement has been growing globally in recent years, sparking alarm from the World Health Organization. A long-discredited paper by Andrew Wakefield was behind much of the scare, but rumours around immunisation have continued to spread, leading to public health risks as not enough people are immune to such diseases. Mr Wakefield was struck off the UK medical register after fraudulently claiming there was a link between the measles, mumps and rubella vaccine (MMR) and autism and bowel disease in children. He made the claim based on the experiences of just 12 children, and no other study since has been able to replicate his results.